36 Hours Tour of Greece (9&10 May 1998) This is an idea of the Hellenic Moto Guzzi club during our usual Monday Souvlaki meeting, with the help of good food and local wine. 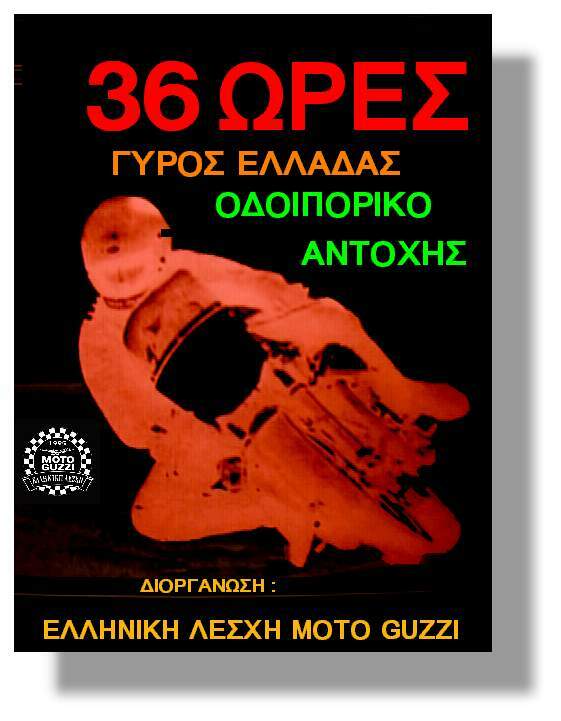 The idea is about making a tour around Greece passing through all mainland's distinct areas. 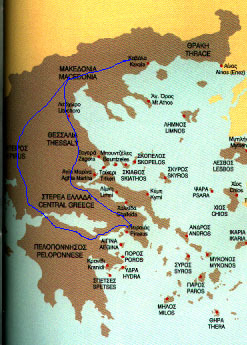 (Sterea Ellada, Peloponesse , Epirus, Macedonia, Thraki, Thessalia) It couldn't pass through our islands because then we would be a sailing club. All kind of bikes are welcome. The starting and ending point will be Athens with an overnight stop in the city of Xanthi. The total covered distance will be a little more than 2000 Km. In order to keep it challenging the 60 % of the distance will be in national and country roads, every participant will choose an average speed, according his bike, skills and confidence, which he must hold as precise as he can. But in no circumstance he is allowed to violate the laws. The tour is offering a nice site seeing through interesting sites as Korinth channel, Ioannina city, Metsovo Traditional village, Katara pass in the mountains, Meteora cliffs, Tembi valley, a narrow pass through the mountain Olympus and Kissavos. This is wonderful opportunity to see Greece from all aspects, some well known places, as well the unknown. Greece due to its geography is offering to the voyager alternate views of mountainous and shore terrain. We have chosen the route of this tour in such a manner that every one who will participate will have the opportunity to enjoy this variety of changing pictures. There will be an award for the most precise drivers. This event is organized for the first time in Greece and we want to repeat it every year, we would be very pleased to see participants from other countries.